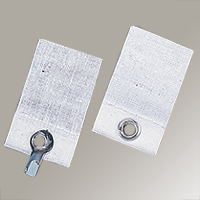 Plastic Screw Anchors "Square Type"
Ensure that surface is clean, dry and free from grease or dust. Mark exactly where the hook will be placed, as repositioning will cause the adhesive to weaken. Peel off the realease paper without touching the adhesive. Place in the required position and press firmly to ensure good contact. Leave in place for 12 hours before hanging item. Moisten entire gummed surface thoroughly. Press firmly onto wall and let dry for 12 hours or more. Do not use where there is excessive humidity or steam. Do not use on acetate, vinyl, plastic or loose paint. To remove, wet entire surface with warm water and slowly pull hanger straight out from wall. Mostly sold in American market. Packed in bulk, blister packaging, compartment box and polybag. Address: No. 125, Ping Ho First Street Chang Hwa City, 50056 Taiwan, R.O.C. Copyright © 2019 U-CAN-DO Hardware Corporation All rights reserved.